Experience the history and scenery of the Emerald Isle, beginning in vibrant Dublin. We hike from the peaks of the Wicklow Mountains to the iconic Cliffs of Moher, with interludes at medieval castles and monasteries. Share good conversation and cold Irish beer in local pubs along the way. After we experience the rugged grandeur of the Beara Peninsula in County Cork, the natural wonders of Killarney National Park await. Walk through old oak forests, past idyllic Irish farmsteads and into remote mountain valleys. Explore coastal footpaths and castle ruins on our way to the Dingle Peninsula. When we arrive, revel in music and merriment at this epicenter of Gaelic culture. Our adventure concludes in Ennis, a market town steeped in medieval heritage and renowned for its traditional music scene and festive atmosphere. Lovers of adventure, history and vibrant culture will find Ireland’s spirited ambience and rich landscapes are not to be missed. This is a great trip for adults and fit, older teens. If you're traveling with younger children, check out our Ireland Family Adventure. One group transfer on Day 1 from a Dublin hotel (subject to certain timetable) and one group transfer on Day 10 to Shannon Airport. Lodging and meals as indicated on the daily itinerary. Professional guide services. Transportation during the course of the trip. Arrive in Dublin and travel to Killiney for a seaside hike. Arrive at the Dublin, Ireland airport by 8:30am today and transfer independently to our hotel in Killiney for an orientation at 11am. This afternoon your guides will take you on a walking tour to explore the picturesque Heritage town of Dalkey, Dublin's principle port in medieval times. We'll walk scenic byways in this colorful seaside town and ascend Killiney Hill for panoramic views of Dublin city, Dublin Bay and the Wicklow Mountains. Considered one of the finest urban seaside walks in Europe, it is a perfect introduction to the outstanding coastal, cliffside and mountain scenery that awaits you in the days to come. Alternatively, return to Dublin city for your own self-guided tour, or while away the afternoon amidst Dalkey's many shops, cafes and pubs. Dinner included. Hiking: 4-6 miles, 2-3 hours; Terrain: Coastal laneways, parkland pathways. Alternate is city streets in Dublin. Example: Dalkey & Killiney Hill walk is 4 miles, 880' ascent. Explore the Wicklow Mountains and the monastic "city" at Glendalough. We begin our day with an interpretive tour of the monastic 'city' at Glendalough. Founded by St. Kevin in the 6th century, Glendalough is an exquisite medieval Irish monastery and remarkable reminder of a uniquely Irish way of life. Next we hike along the Wicklow Way and into Glenlo Valley to experience the beauty and solitude that St. Kevin sought there. At the conclusion of our hike we leave behind the austerity of Kevin's hermitage and return to our lodgings in Killiney. All meals included. Hiking: 7-9 miles, 4-6 hours; Terrain: Green roads, hilly trails, and boardwalk; Example: Glendalough & The Spinc is 8 miles, 1774' ascent. Driving: 1.5 hours. Discover Cahir Castle and hike the Glengarriff Woods. Cahir Castle is one of Ireland's oldest, largest and best-preserved castles. Built over 800 years ago on a rocky island in middle of the River Suir, the castle's history includes the Norman invasion and capture by the Earl of Essex in 1599. After exploring the castle we make our way to the outskirts of Cork City for lunch before continuing on to Glengarriff on the rugged Beara Peninsula. We hike in the spectacular Glengarriff Woods Nature Reserve, nestled in the sheltered glen between the Caha Mountains and Bantry Bay. Afterwards we journey to Castletownbere, a small, colorful town that is the largest whitefish port in Ireland thanks to its location overlooking Berehaven Harbour. All meals included. Hiking: 2.5 miles, 1+ hour. Terrain: Forest paths and coastal trails with 225' ascent. Driving: 5 hours. Ferry to Bere Island for island hiking and enjoy Castletownbere. Today we stroll along the harbor in Castletownbere before taking a short ferry ride to Bere Island for a spectacular day of island hiking on one Ireland’s best kept secrets. Strategically guarding the entrance to Bantry Bay, Bere Island’s rich heritage includes archaeological sites from the Bronze Age to Medieval times along with many reminders of its great importance in Ireland’s military history from the 16th century onwards. Boasting a mixture of splendid isolation and breathtaking coastal scenery, Bere Island has also been voted Ireland's tidiest Island, with Islanders extending the warmest West Cork welcome to all visitors. We’ll hike to a lighthouse, have lunch at a signal tower, and follow old military tracks along the Beara Way before returning to the mainland where we can conveniently amble to a famous pub to celebrate the day or back to our comfy B&B. Overnight in Castletownbere. All meals included. Hiking: 7-11 miles, 4-5 hours; Terrain: Waymarked walk over rolling hills, which can be boggy and disused military roads; some sections on quiet paved roads. No driving. 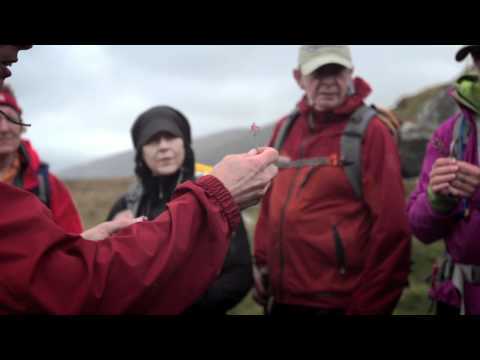 Hike remote headlands on the Beara Way and explore scenic Kenmare. Starting with a visit to an ancient stone circle, we traverse the Beara Peninsula to the very tip of the mainland, a prime spot for whale and dolphin watching. There we’ll undertake a series of dramatic headland hikes on the Beara Way in one of the most remote settings in Ireland. From the fishing village of Garinish to the far-flung Allihies, the village furthest from Dublin in all of Ireland, all walks are sure to yield breathtaking views of cliff and coastal scenery and idyllic Irish farmsteads. Afterwards, we complete the Ring of Beara as we journey to Kenmare, one of Ireland's most friendly and decorated "Tidy Towns" for our two-night stay. After settling in our town-center lodging, you’ll have free time to explore Kenmare with optional walks and terrific opportunities to dine, shop and enjoy traditional Irish music throughout this celebrated and colorful town. Breakfast included. Lunch and dinner on your own. Hiking: 4 mi, 2-3 hours; Terrain: Waymarked hills and headlands, exposed heath, rolling hills with some steep sections; minimal road walking. Driving: 2 hours. We have several options for our hike and your guides will choose the most appropriate trail based on weather and other factors. One favorite section of the Kerry Way, on the Old Kenmare Road, will lead us through old oak forests, along centuries-old droving roads, past waterfalls, and into remote mountain valleys. Another Kerry Way walk leads to the ancient ruins of Muckross Abbey, down tree-covered serpentine paths beside the shores of Lough Leane and Muckross Lake, and into secluded and rare yew woodlands. Or we may choose the ascent of Torc Mountain, a hike that combines oak woodland, mountain valleys, a waterfall and an unparalleled bird's eye view of the Lakes of Killarney. All meals included. Hiking: 4-10 miles, 4-6 hours; Terrain: Trails, gravel roads, boardwalk and paved paths with elevation from relatively flat to mountainous; Example: Kerry Way on the Old Kenmare Road is 7.3 miles, 1,596' ascent. Driving: 1.5 hours. On our way to Dingle, explore coastal footpaths and castle ruins. The streets of Dingle beckon with an array of unique shops, cafes and pubs. Getting there is half the fun, so on our westward journey we take some superb walking diversions! Inch Strand is a three-mile long beach jutting out into Dingle Bay at the foot of the Slieve Mish Mountains. On the Dingle Way in the parish of Minard, we explore a ruined castle, holy well and storm beach. After arriving into Dingle town and checking into our lodgings, the remainder of the day is free for exploring on your own. For guests wishing to hike, there are scenic walks along Dingle Harbour that start right in town. We have two nights to enjoy the legendary nightlife in Dingle's many pubs, including an invite to a private afternoon trad concert at one of Dingle’s most famous music pubs. Breakfast included. Lunch and dinner on your own. Hiking: 1+ miles, 2+ hours; Terrain: Beach, harbor paths, paved roads and low coastal elevation. Driving: 2 hours. Experience Dingle town and choose from a variety of exceptional hikes. The Dingle Peninsula is a "Gaeltacht" or center of Irish-speaking culture, and a repository of antiquity, including thousands of archeological sites. We'll take an archeology tour of some of the peninsula's famous sites, including the Gallarus Oratory, a place of worship for early Christian farmers of the area. Shaped like an upside-down boat, the simple dry-stone structure has remained waterproof and in near-perfect condition since 700 AD. We'll also enjoy a series of carefully selected walks designed to showcase the Dingle's coastal headlands, beaches and mountains, all the while interweaving Dingle's lively history and folklore. Back in Dingle, the evening brings more opportunities for "Ceól agus craic"—music and merriment. All meals included. Hiking: 3-6 miles, 3-4 hours; Terrain: Open hiking over exposed headlands, rolling hills with some steep sections. Driving: 1.5 hours. Hike the Cliffs of Moher and overnight in the lively town of Ennis. We leave Dingle and make our way through North Kerry to the mighty River Shannon. After crossing the Shannon by car ferry, our scenic drive along the Co. Clare coastline brings us to our final hike on the magnificent Cliffs of Moher, one of Ireland’s most iconic destinations. There we’ll meet our local guide who will regale us with stories from the area as we hike along the Cliffs to the famous village of Doolin. Views from the Cliffs include the Aran Islands in Galway Bay and the majestic mountains of Connemara to the north. Afterwards we transfer to our hotel in Ennis for a farewell dinner to celebrate Ireland and newfound friends. With its vibrant nightlife, traditional music scene, festive atmosphere and medieval heritage, this bustling market town is an ideal location to continue your explorations of Ireland. All meals included. Hiking: 4 miles, 3 hours; Terrain: Waymarked clifftop path, well protected and ancient roadways with minor inclines, route is primarily downhill. Driving: 3.75 hours. Our Ireland Coast to Coast Hiking adventure ends today in Shannon. After breakfast we depart Ennis for the Shannon airport, arriving around 9:00am. Departing flights can be scheduled for 11:30am or later. Breakfast included. Transportation to the trip starting point. Airport transfers resulting from arrivals/ departures outside of the normal timetable. Insurance of any kind. Alcoholic beverages. Optional guide gratuities. Items of a personal nature. Conchúbhair grew up in the Kingdom of Kerry in a Gaelic speaking household. He has played semi-pro rugby and tried his hand at farming in Australia. He loves welcoming people to Ireland and showing them his native land. Sarah is a passionate outdoorswoman, who lives in Gormanston, Co. Meath with her husband and two children. Sarah fulfills her love for hiking and the outdoors by sharing it with others as a guide for REI Adventures. True immersion into the Irish landscape and culture. Meet up with local Irishmen who share their stories of growing up in Ireland and end the day at a lively pub downing a Guinness, listening and dancing to traditional music.